Commissioner Fanti: Your police are better than mine. Roch Siffredi: And often the same. Jacques Deray's Borsalino and Co. is a mixture of Alain Delon star vehicle and a cheap thriller trying to cash in on the immense success of The Godfather. Its story is contrived, yet engaging; the acting typical, but effective. It has no pretensions of being anything other than a stylish gangster film and, consequently, makes for a damn fine night at the movies. 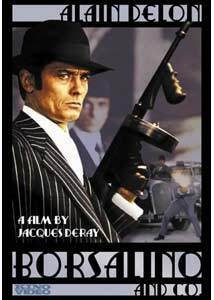 Roch Siffredi (Alain Delon) is a powerful gangster in Marseilles, but his close friend and associate has just been murdered. It turns out that the brother of an even more powerful and new crime lord, Giovanni Valpone (Riccardo Cucciolla), is responsible. The belligerent police commissioner Fanti (Daniel Ivernel) warns Siffredi of Valpone's powerful financial connections, but vengeance trumps all and a mob war ensues. It's not so much a war as a slaughter, with Siffredi's club and bordello being ruined. Practically all of Siffredi's crime syndicate is diminished in a few hours and he is captured by Valpone's sadistic henchman, Sam (Reinhard Kolldehoff). Of course, Siffredi is captured only after mowing down a dozen of Valpone's men as if he were John Rambo. Valpone successfully removes Siffredi from Marseilles' streets, arranging for his confinement at a mental hospital. Free to run the city on his own, we learn that Valpone is planning to deal heroin to weaken the city's guard and allow the Nazis to conquer Europe (if you're wondering why an Italian gangster would be conspiring with Hitler over Mussolini, you're watching the wrong movie). But don't count Siffredi out yet, for with the help of his loyal friend, Fernand (Lionel Vitrant), he escapes the insane asylum to wage another war against Valpone. The film contains a great deal of style, especially in its production and costume designs. The cinematography is atmospheric, with so much cigarette smoke permeating practically every frame that you may as well light one up yourself. Alain Delon is a man of few words as Siffredi, but his physicality carries off the part quite well. Cucciolla's turn as Valpone, however, is not quite as impressive as he lacks the physical presence to portray Valpone as a threatening character. Fortunately, he has enough fun in his line readings, relishing almost every diabolical word, to alleviate that flaw. Director Deray's handling of the script is assured and furious, moving from one violent shoot-out to the next with a relentless focus on the action. Sure, there are many loose ends, ranging from how Siffredi is able to rebuild his crime organization to how Valpone is unable to effectively shut him down the second time around. Borsalino and Co. won't pass as a great crime drama, but everything holds together for it to serve as a fine action movie. Image Transfer Review: The anamorphic 1.66:1 widescreen transfer appears to be slightly washed out, though this could be a result of the original material. Colors don't leap out at you, nor does the contrast. Blacks look good, though, and there's a strong filmlike look, thanks to a good amount of detail. Audio Transfer Review: The French mono track preserves the original theatrical sound mix well. There's a slight hiss, but it's not distracting. Otherwise, music and sound effects come across quite nicely (particularly during the opening funeral scene, which has a lot of bass). The overall mix sounds fairly crisp and clean and spreads nicely across the front sound stage. Still Gallery—a collection of still photographs from the movie. Extras Review: Extras are pretty scarce, consisting of the original theatrical trailer for Borsalino and Co. and the trailers for The Sicilian Clan, Les Clan des Siciliens, Deux hommes dans la ville, Flic Story, Mort d'un pourri, 3 hommes à abattre, Pour la peau d'un flic, Parole de flic, and Ne reveilles pas un flic qui dort. Each of them stars Alain Delon and is shown in nonanamorphic widescreen and without subtitles, with only The Sicilian Clan being in English. I don't speak French, but anybody can tell that all of these movies contain a lot of action on the basis of their trailers. There's also a brief still gallery and the original theatrical poster. Finally, there's a selected filmography for Alain Delon. Stylish and entertaining, Borsalino and Co. is a good action movie that uses the Mafia genre to add some flare to its revenge-oriented script. The image and sound transfers are adequate, but the special features are pretty weak.